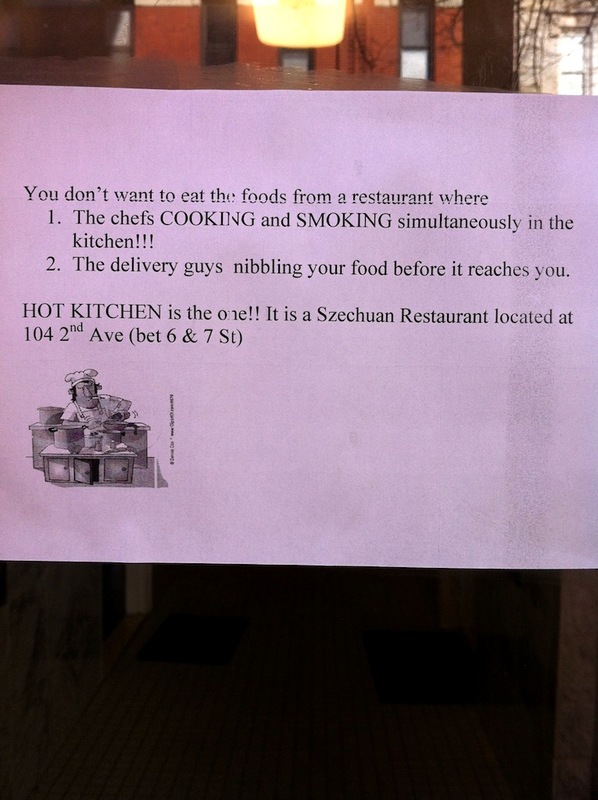 Dave on 7th passes along this sign that he spotted on Seventh Street and Second Avenue... We're unsure if this is supposed to be for or against Hot Kitchen, the Sichuan restaurant that opened last September on Second Avenue near Sixth Street. Try our famous Smoke Fried Rice. Not sure if that's for a or against. Anyway, Hot Kitchen botched up our delivery order twice, and it was not easy to get it corrected, getting put on hold endlessly on the phone, etc. The resulting food was bland and nothing special. That was in the first week, so perhaps they've improved since then. In a related note, why the lack of Chinese restaurants in the East Village? They've definitely improved on the delivery since the first week. My order came within 20 minutes on Friday night around 10. I'll have to check this place out, always looking for a new Chinese place! Same sign appeared on my building. The wording is a bit odd. Led me to speculate idly that it is a negative ad campaign by another Chinese delivery. also it made my boyfriend a bit ill.
and this sign here-about the cooking/smoking/nibbling...found this taped to my apartment door last nite. a bit aggressive, no? we LOVE it. just don't order from the section that says "American Chinese Food"! come on, it's gonna be bland! get the unfamiliar stuff. (unless you have nut allergies like the earlier poster -- sorry about that.) this is Northern Chinese food and it's supposed to be spicy! just figure that any dish whose name you don't recognize or that uses a ton red chilies or Sichuan peppercorns is gonna be good. oh, the stuff with cilantro is great too. for those who like that sort of thing, this is the sort of thing that they will like. Grand Sichuan on St Mark's between 2nd and 3rd is great too. Walked by yesterday; it's closed by the DOH.